1. What is volt modification? 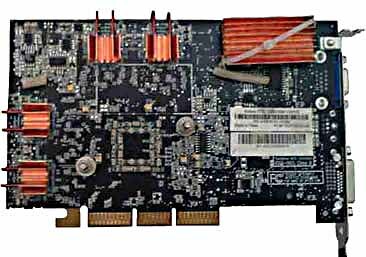 It's not easy to answer the question whether volt-modification is needed to survive when gaming requirements for hardware, in particular video adapters, are getting tougher, or it is a way to squeeze more potential from a video card to get more FPS in games. The video card tested today has a performance level sufficient for all existent games, that is why it matches the latter option. For low-level solutions such modification is a way to get more FPS needed for acceptable gameplay. Volt-modification is an attempt to increase a video card's overclocking potential by changing its internal working voltages (memory, GPU, I/O circuits). But such attempt doesn't guarantee a higher performance. This procedure is identical to changing CPU and memory voltages from BIOS. One can resort to it if a given video card doesn't provide such software means. For this video card volt-modification simply demonstrates its overclocking potential because its performance in gaming applications is not critical. Standard overclocker's principle: to get more for nothing. I must say that we didn't aim at overclocking the video card extremely for revealing core and memory maximum potential (with various coolants) but wanted to get the fastest possible system that would match any home PC. The list below shows the tools we used, but it is not a reference set. Any component can be replaced at your option. 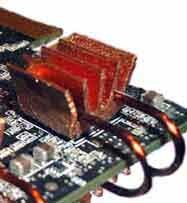 KPT-8 grease (used as thermal interface between heatsinks and chips). You will also need documentation and circuit diagrams (see the details below). Well, it's time to have a look at the video card's specs. In this section we test the pre-overclocking performance. The scores will be further used for estimating the performance increase after overclocking. 3DMark 2003 v.340, it directly depends on video card's speed and reflects all frequency changes. Quake 3 Arena ver. 1.32 (for revealing performance gain in old applications). Unreal Tournament 2003 (for revealing performance gain in latest applications). 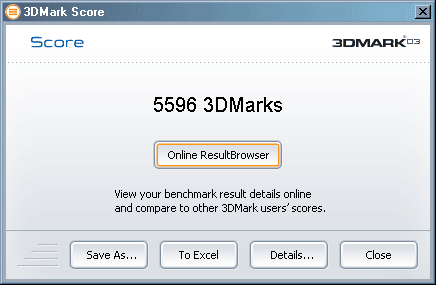 3DMark 2001 SE v330 for testing speed of applications using DirectX7 and DirectX8. We didn't make a special accent on testing the card's performance because the today's aim is to find out if volt-modification is justified. The test conditions are ordinary: running applications (Apache, Ftp server, VirtualCD, PowerStrip, LanChat, CdSlow) were not taken out of memory. This compact cooler is able to ensure a reliable operation of the GPU at the default clock speeds as air is taken out in all planes. But the cooler is not big enough for overclocking. Besides, the fan is pretty small and its fast rotation makes a lot of noise. 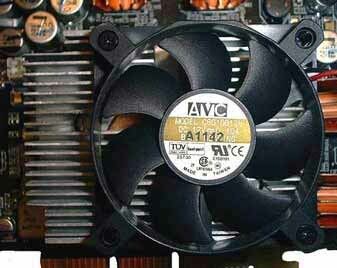 Moreover, this particular fan turned out to be of low quality, and 2 months after its purchase it outcried all other fans and produced sounds unpleasant for human ears. The video memory had no cooler at all. Taking into account the layout of all the components let's design a new cooler. 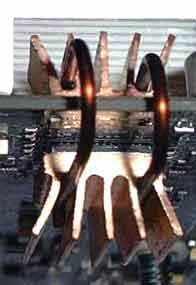 The new heatsink is based on Thermaltake's Vulcano 6 Cu because it has the matching size, a big copper plate in the base to ensure better heat removal; besides, it's not that expensive. 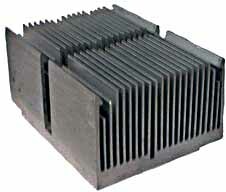 The heatsink (without a fan)) measures 80*40*62 mm. 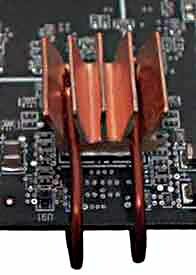 The copper cooler marked AVC C6010B12H was used for the memory. Since we plan on overclocking the memory up to the upper limit, such solution will considerably increase heat removal. 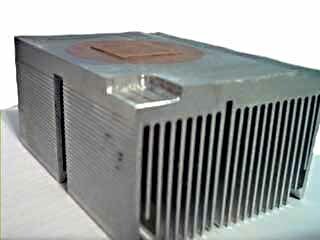 That is why we needed an effective passive (for quiet operation) cooler, and we have decided on that inexpensive copper heat sink. Now we turn to designing a cooler. Before installation of the heatsink we made it twice lower - 20 mm. 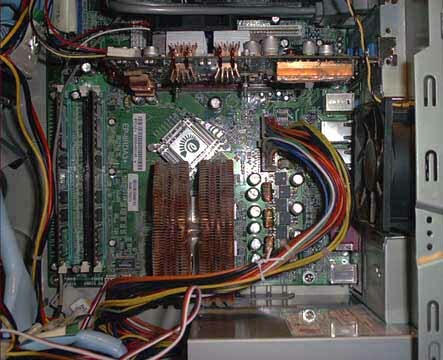 It's sufficient for effective cooler, and such design won't lock free PCI slots on mainboards which have the first PCI slot facing up (EPOX 8RDA3+). Such boards have a 35mm gap between the AGP and first PCI slots. We made holes in the sink base for projecting parts. Their size and location were experimentally calculated due to the difference in PCB designs, rated values (and sizes) of the parts and their location. ATTENTION! 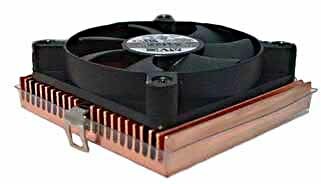 The fan is shifted from the die center as far as the heatsink size makes it possible. It was done to prevent the dead area (area under the fan center without any air flows) above the die and make the latter blown with a strong air flow (which increases as the distance from the fan's center grows up). The sink is screwed through the standard holes in the video card. Let's dwell on the procedure of pressing and clamping the sink to the card. Nut (fixes the whole construction). After that we made 8 small heatsinks out of the AVC sink (sawed it into 8 ones), each being a bit larger than the memory chip. 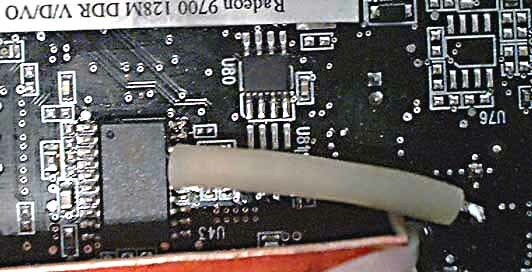 The remaining part of the sink used for cooling the GPU voltage regulator. 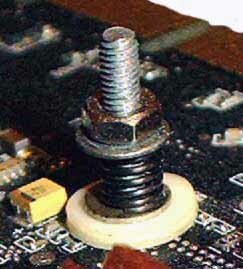 The only problem in installation of the heatsinks was their mounting. For volt-modification we need a soldering iron, a digital multimeter with the internal resistance at least 10 MOhm (it's needed to exclude the measurement error of the multimeter). In our case it was MASTECH MY-65. Wire (you'd better use a braid of three wires as it makes the connection to the control points more reliable and easily accessible), two precise variable resistors (they should be wire-wound resistors because of small Ohm steps), and their accuracy should be within 1-10%. Rated values: 30 to 100 KOhm. ATTENTION! The theoretical maximum memory clock speed can be calculated by dividing 1000 by the memory access time in nanoseconds. In our case the access time was 3.3 ns, that is why the maximum possible working frequency was 303 MHz, or 606 MHz taking into account the DDR type. Before increasing the memory power supply the clock rate was 570 MHz, i.e. much lower than the limit. Memory voltage is usually lowered by manufacturers to separate the market segments. The fact that the memory clock speeds exceeded the theoretical ones after the volt modification procedure was to the credit of the given sample. That is why if it's possible to overclock memory on your card using the software means think well before starting volt modification (the experience show that the working clock speeds almost always exceed theoretical ones after such modification). For the measurements you have to solder the wires to the outputs 8 (+ internal circuits (VDD) of the memory chips), 7 (GND common) and 5 (a padding resistor (which should be variable at the first state of resistance selection) is soldered between the 5 and 7 outputs). Voltage is measured between outputs 7 and 8, and it was 2.8V in our case. We DO NOT RECOMMEND that you take our values as reference ones because you will most probably have different ones as it depends on the card maker and its memory. Even the same cards from different lots can differ. The output voltage of the internal memory power supply circuits is assigned by the resistance ratio in the feedback circuit. To increase the power supply voltage you should change this ratio by adding a padding resistor; it makes the voltage on the feedback circuit output lower, and the controller which compares it to the reference one increases this voltage up to the needed level, though the real voltage turns out to be increased. The 47 kOhm wire-wound resistor of 10% tolerance was chosen as a variable one. ATTENTION! While increasing the core and memory voltage we recommend that you solder a fixed resistor of 1.5 to 2 kOhm in parallel to the variable one. Without the additional resistor the variable resistance can drop much causing an increase in power supply on the respective blocks. These measures avoid damage of the card. Now we proceed to the key operation - the voltage increase. To increase the GPU stability at the increased clock speeds and to prevent any artifacts in case of overclocking at the rated power supply (we could see a chessboard-like screen and a distorted shape of some 3D objects in some screen parts) you should raise the GPU power supply. In contrast to the memory volt-modification, for the GPU you increase the voltage on a different power supply controller chip. The padding resistance and location of the control points change at that. The weak point of such approach is that you have to unsolder the resistors from the board because of the large capacitors at the converter output. The precautionary measures and the principle of operation when increasing the memory voltage is similar to the memory volt modification. If you see white ripples on the screen after turning it on after all the modifications, it means that you applied to much power to the GPU which can soon initiate irreversible processes and change the core structure (damage the internal circuits and some of the die's parts). You must solder wires to the outputs 16 (+converter output stages), 18 (feedback output where you set voltage by changing the resistance, with a padding resistor added between this output and output 20) and 20 (GND common) to change and control the voltage. The voltage is to be changed between outputs 16 and 20 of the power supply chip SC1175. Like in case of ISL6522 chip the output voltage can be modified by changing the resistance ratio in the feedback circuit. A padding resistor is to be added between outputs 18 and 20. NOTE! Similarly to the memory modification, you should solder an additional resistor of 1.5 to 2 kOhm in series to the variable resistor. You must control the voltage increase and test the video card at every step. The end-point voltage on the GPU and the padding resistance is to be calculated when the wanted result or the maximum working GPU clock is reached. In our case it was 1.65V, and the resistance was 9.1 kOhm. The card's operation is considered steady if it passes 3DMark 2003 three times without artifacts and Mother Nature four times without artifacts (this is the heaviest test, and problems, if any, will be quickly revealed). Video memory clock: 620 MHz. 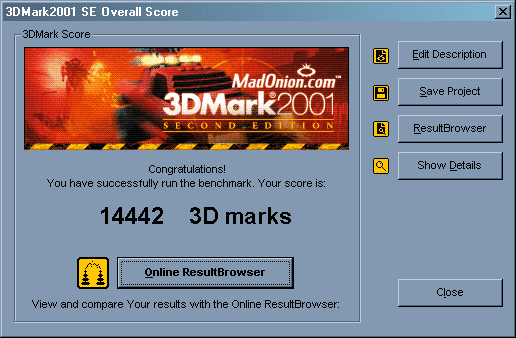 Note: it turned out that 3DMark 2003 is not enough: at first, the steady clock was found to be 410/635. The test packet passed it several times without any artifacts. However we noticed distortions in games 20-30 minutes after the game started. That is why we had to reduce the clock speeds. The overall performance increase in 3DMark 2003 is 27%. The overall performance increase in 3DMark 2001 SE is 18.6%. Performance gain wasn't estimated in the separate subtests of 3DMark 2001 SE. The general performance increase is 25-30% in all applications. Judging by the 3DMark 2003 the picture looks logical: the heavier the test, the greater the speed drop because of the great load on the video card. The texturing speed is 1.5 times greater at least, and it will have a positive effect on games that deal with large textures. In Quake 3 Arena in the heavy mode the overclocking has a greater effect too as the load is greater. In Unreal Tournament 2003 the scores depend mostly on the CPU. Now, when the card has a nice appearance, let's also modify its BIOS. A higher overclocking potential. It can be obtained by reducing CAS from 2 to 1. It makes the latency lower and the card steadier at high clock speeds. But in our case the attempt to set CAS 1 resulted in artifacts at all clock speeds, even default ones. Such method can be used for video cards having the memory working at higher frequencies (presumably from 700 MHz). We didn't want to resort to software overclocking all the time. After all the tests were finished the following clock speeds were set: 400/620. They were flashed into BIOS. Problems occurring when one uses a software overclocking utility. At OS booting, at the moment of setting the new clock speeds for the video card we could notice 3-4 black "noisy" squares. The same artifacts appeared later, after the OS was booted, even without games. The PC reboot didn't help because even the POST display had distorted symbols. Only PC restarting could help (turning on/off). First at all we thought that we set too high video memory voltage, but the artifacts appeared when the video load was minimal. So, we decided to set new clock speeds in BIOS, and the problems disappeared and never appeared again for 2 weeks. Well, we suppose that this artifact takes place as the overclocker sets clock speeds incorrectly. But why did they appear while the system was working? Is it because the utility regularly restores the specified clock speeds? The questions are actually addressed to the developer of this utility. ATTENTION! Before flashing the BIOS remember the Flash ROM chip type of your video card so that you can be sure that the flash software supports a given Flash type. IMPORTANT NOTE! If you have SST M25P05 Flash ROM DO NOT use Atiflash for flashing in BIOS. In 99% of cases you will get the message Timeout: Poll rom idle after bulk erase. It means that the flash is erased but a new BIOS can't be recorded. 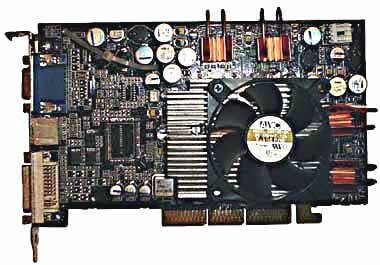 The video card doesn't work anymore. Only a PCI card can help it... but the attempts to reflash the BIOS with Atiflash resulted in the same error, and other flash utilities do not see this adapter at all. The only program that could flash the BIOS was FlashROM 1.3 (ATTENTION! The versions over 1.3 do not help and display the message VGA Adapter not found). 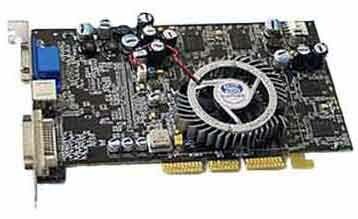 It's DESIRABLE that you use the video card's own BIOS saved on the disc in advance because BIOSes of video cards built on the same graphics core differ (the difference can be caused by any factor: manufacturer, video memory supply voltage, GPU supply voltage, the way the primary blocks get power, electrical scheme etc.). 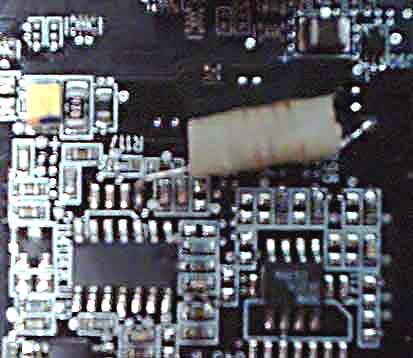 If you flash BIOS taken from a third card without checking characteristics of its nodes you can make its operation unsteady and even damage the card. After all those time-taking experiments with the BIOS we got only one important advantage: new clock speeds were flashed into the BIOS. At the same time we changed the TV standard from NTSC to PAL. All the experiments gave us more food for thought. We spent quite a lot of time for all the designing and developing and got a card the performance of which increased by 25-30%. The Sapphire RADEON 9700 performs even better than the PRO version. 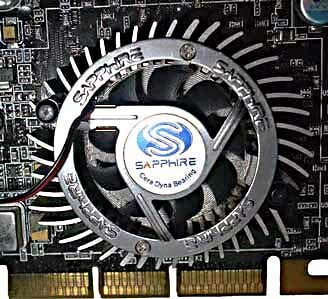 This card can be named Sapphire RADEON 9700 XT. We described all the problems we faced when improving the adapter. And we hope that this article will help those who'd want to carry out volt modification of their cards. We believe that this review will help you decide whether it's worth modifying your card this way. This volt modification process was recorded! The clip can be downloaded from here (95 MBytes!). We express our gratitude to Driver.Ru and Sergei Komarov.